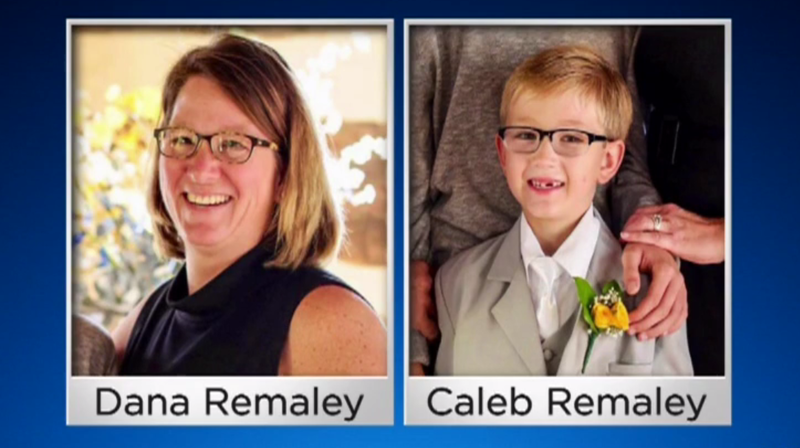 NEW STANTON, Pa. -- A 14-year-old boy is accused of shooting his mother and 8-year-old brother once each in the forehead as they slept and calling 911 to insinuate his father did it, Pennsylvania state police said Thursday. The 14-year-old called 911 just before 7 a.m. Wednesday, saying his mom and younger brother were dead and his father placed a gun in his bed before leaving the house, State Police Trooper Stephen Limani said at a news conference. The 14-year-old later told officers he took a gun from atop the refrigerator, loaded it and then shot Dana Remaley and Caleb Remaley after his father, David, went to work, police said. Remaley also allegedly told police he would have shot his father, too, had he been at the home, about 25 miles southeast of Pittsburgh. During the time before troopers arrived, the 14-year-old apparently retrieved the gun and was walking down the street carrying it when he encountered neighbor, police said. That neighbor engaged the boy in conversation, leading him to discard the gun and approach officers, Limani said. “This is a very horrific time, a very difficult time for this particular family and the community here in New Stanton. To have two individuals shot in their home while they are sleeping, it’s very traumatic,” said Limani, according to CBS Pittsburgh. A friend of the family described the 14-year-old as a polite, kind, straight-A student who was involved in sports and in church. “He’s such a good kid,” she said. The 14-year-old was still being medically treated Thursday, and mental health evaluations were pending, Limani said. He is awaiting arraignment on two counts each of criminal homicide and first-degree murder, charged as an adult. No attorney information is available.